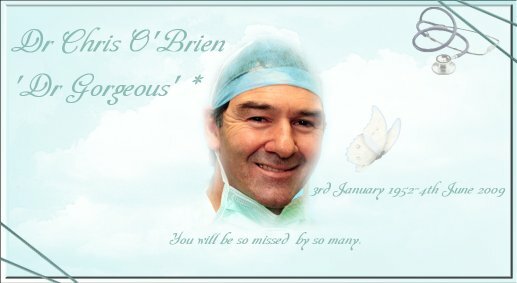 From the first time I saw in RPA, Channel 9's show (over 12 years) I was so taken with his bedside manner with his patients from all walks of life. His candour and compassion was indeed a rare gift and was part of his wonderful charm. In November 2006 ( a bad year for me also) I recall watching a fence being built for us when chit chatting with the builder, he said 'did you hear the very sad news about Dr Chris from the RPA show? 'No', was my reply, and when he told me I was totally gob-smacked and I didn't really want to believe him. This news quickly made the TV and radio and it saw him being being admitted to PA for merry-go-round that would overtake his life and change it completely, from doctor to patient. This aggressive tumour was diagnosed on the 26th November 2006. He experienced a week of confusion before his diagnosis. The constant headaches and looking back various thoughts of vagueness and confusion, also experienced nausea and fatigue and knew something was really wrong and after a week of this, his wife Gail drove him to PA hospital. Now it was total role reversal, and his friend Dr Michael Besser delivered the result, the one we would dread hearing, incurable. This insidious cancer, Glioblastoma multiforme, sadly is not one that can be overcome and patients die. From that time on his slow painful death was played out to us on the screen and the media. Stan Zamanek had died 14 months after being diagnosed with the same cancer. November 2006 and for Chris, this delightful doctor and his family, his world came toppling down. Headaches, nausea, vagueness, vomiting, confusion over a period that last week of November 2006 gave him him the news we just never expect to hear cancer in the worst form. This was indeed bombshell for Chris and beloved family and for us our hero now needed our prayers. Dr Michael Besser delivered the inevitable tragic news to Gail and Chris, that this insidious cancer would see him die within around six to twelve months. No good outcomes promised. AS I type here some very strange things are happing and things keep disappear from my notes, so I have decided to revamp this, just in case there is force out there preventing this from being on the net. Tears fill my own eyes as I type here. 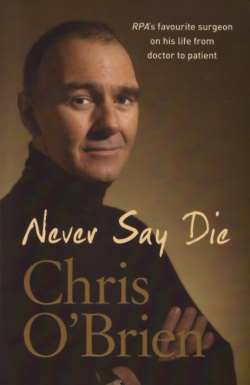 Seeing his face on the cover of his book written before he died 'Never Say Die' available at good bookstores here in Australia. There are some many people out there, oxygen thieves, yes, total wastes of space, lying, being racist and there is Chris who contributes to life with all his heart and soul, unlike many others would leave the world and no one would notice or really care. He went away for few days at the end and deteriorated rapidly and he was brought back to PA where he died in the company of his family on the night of the 4th May. I was away and read it on the Net that he probably would not last the night and then got the news via SMS that he had died. I sobbed for some time, as like others and his family we all hoped he could defy the odds and beat it. Kevin Rudd who had become a friend visited him on his last evening offering to give him a State funeral. Federal funding had been upgraded to 100 million in April 2009 and although Chris wished he name was not going to be used however the family has agreed to name it after him. I don't actually believe his wishes should be ignored, but that is their decision and we must abide by that. As of now 200 million has now been promised but probably would need around 300 million. Building would probably commence later in 2009. Juliette and Gail spoke so very bravely, making that shining 'Dr Gorgeous' (Gail's' nick name) in heaven so very, very proud. Chris will be missed, but your legacy and hard work that and long hours has not been wasted. All I can say that if 1000.000 are diagnosed with cancer each year and sadly 40.000 die from it in Australia your legacy will be forever remembered.